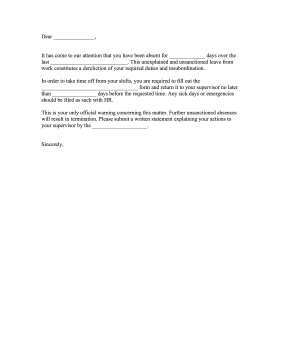 This printable complaint letter chastises an employee for being absent or taking unexcused time away from a shift. It has come to our attention that you have been absent for _____________ days over the last ____________________________. This unexplained and unsanctioned leave from work constitutes a dereliction of your required duties and insubordination. In order to take time off from your shifts, you are required to fill out the ___________________________________ form and return it to your supervisor no later than ________________ days before the requested time. Any sick days or emergencies should be filed as such with HR. This is your only official warning concerning this matter. Further unsanctioned absences will result in termination. Please submit a written statement explaining your actions to your supervisor by the ____________________.